Speaking of my sister, in order to create a little less stress for the holidays, we now just pick one family member to buy for, and this year I had my sister. (you might remember I had my brother last year). 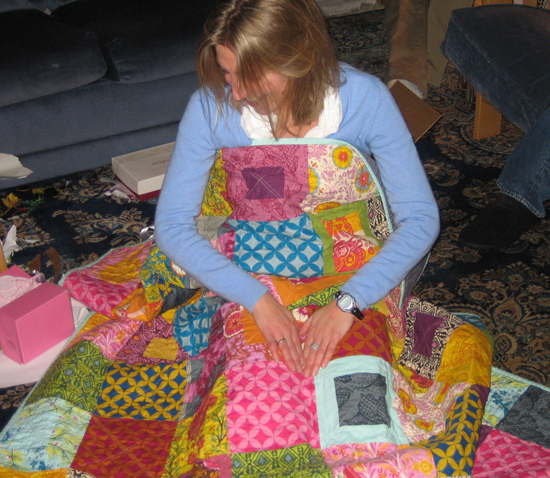 Anyway, strangely enough, even with all the quilting I do, my sister still was without a handmade quilt! Whitney definitely hears way more about fabric and quilts than she’d probably like to, but being the sweet sister she is, she always acts interested and is always one of the first to exclaim over each new quilt I make. And while she doesn’t have any interest in sewing or quilting, she does have very definite opinions on fabric, designers, and quilts. 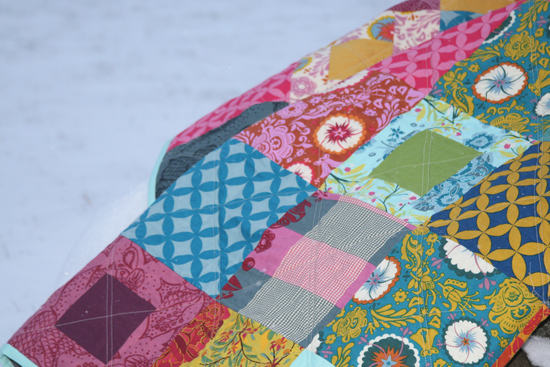 So I knew that any quilt I made for her would have to include Anna Maria Horner’s Good Folks. In the end, I opted to use the entire line — why add in anything extra when they already look so beautiful together?! Now, I won’t lie. I did wait until the last minute to make this quilt, though hopefully that doesn’t diminish the amount of thought that went into it. I’m just a procrastinator… I can’t help it. Since my time was limited (and since my sister was often at our house!) I went for a simple design, cutting the fabrics into 8″ squares. I love a simple quilt made up of squares, and it worked well with this fabric line, allowing you to really see the beautiful designs of each print. 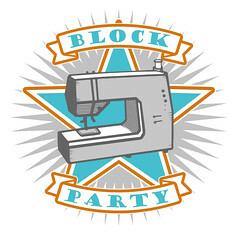 To add a little extra something something, I decided to add in a few corresponding solids – making a few blocks with solid centers/printed borders and some with printed centers/solid borders. I don’t have a picture of the back, but it was predominately my favorite (and also my sister’s favorite, luckily!) Kona Coal, with a nice wide patchwork strip of the Good Folks fabrics. Since Whit seems to have an aversion to any quilt that’s overly quilted (“ack, not soft enough!”) I went with my favorite straight line quilting – one line running diagonally through the blocks in one direction, with a double quilting line running diagonally in the other direction. Thanks Whit, for being so supportive of my totally obsessive hobby! I hope you enjoy your quilt for many years to come! 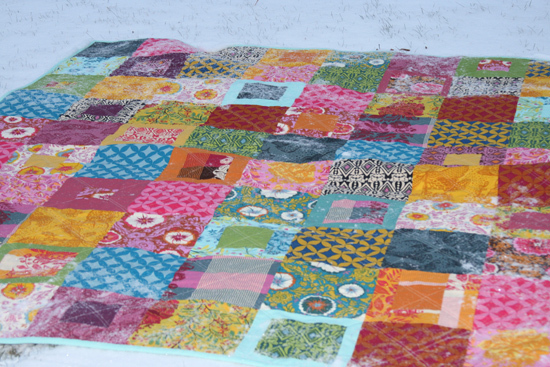 This entry was posted in [search] Charm Quilts, 2009 Finished Quilts, Finished Quilts, Posts about Quilts, Quilts and tagged anna maria horner, good folks, handmade, patchwork, quilt, quilting. Bookmark the permalink. 42 Responses to Whit finally gets a quilt! So sweet, and great pics! I also gave an anna maria quilt for Christmas, but with the Garden Party line. I just love that Good Folks, and your pattern looks great with it! 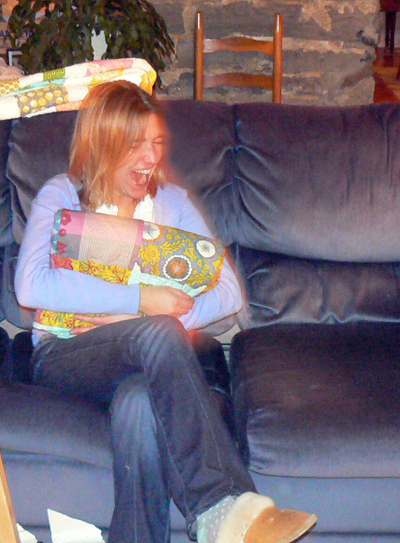 that is the best reaction to a quilt gift… seriously that made me happy to see.. so i’m sure you were happy as can be!! Thank you SO MUCH for my quilt, and for knowing me so well – my love of Anna, Kona Coal, straight line quilting and your spectacular eye for design. I feel so lucky to have such a talented (and generous!) sister. Well heck yee-ow she liked it!!! Just look at that face!!! What a beautiful quilt & such a great reaction! Cute! Oh, that’s great. Thanks for the pics. I gave a quilt this Christmas that wasn’t nearly so enthusiastically received, so I’m enjoying it vicariously here. Oh so Pretty!….my nieces and nephews got there quilts from me as well and I didn’t have time to wash them…and there was a fight to see whose quilt could make it to the washing machine first, but in the end everyones quilt looked great and they love covering up with them…..and I’m sure your sister will always love her quilt. Beautiful! I love the line, too. And your sister looks totally happy about it, too. I absolutely love how handmade gifts make people SO HAPPY. Beautiful quilt. Now I know what I’m going to do with my AMH fabrics. Hmmm. Should it be the flannels or the cotton? Maybe I’ll make one of each. I loved reading this post and seeing the photos. 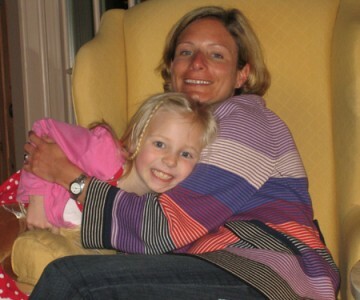 Made me a little teary-eyed reading about your supportive sister and how much she reminded me of my own. 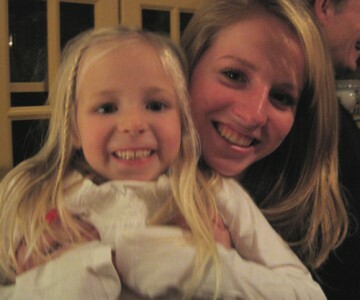 And my sister and I have bought the exact same clothes before, even living states away from one another. How fun. Way to go! I found myself in the same quilt spot as you this Christmas. I finally made my mom a quilt. It was long overdue since she gifted me my sewing machine back in March. I didn’t start it until the 20th of December and I put the last binding stitches in just before I gave it on Christmas morning. There’s something so wonderful about sharing a gift with someone who really appreciates what goes into it. Great Pics!! The quilt turned out wonderful! love the quilt, and wanted to let you know that my sister and I do the same thing with clothes all the time. and we live on opposite coasts from each other. It’s a sister thing. Beautiful quilt and wonderful reaction! You know that this one will be loved! How wonderful to make a quilt for a sister who loves it sooooo much!! LOVE the quilt! it is sooo cute and colorful! I’m glad to see that Whitney loved it. I think you did a great job of meeting her needs. Also, I went back and looked at the quilt you gave Ryan and that is HILARIOUS!!! And soo totally perfect for him. Haha I’m sure he loved it! And I hope it helped his OCD a little bit. Did she scream for joy? I sure would have! That quilt is absolutely gorgeous!!!!! Don’t you just love the look of joy on the faces of those who love our quilts! This is EXACTLY what my sister, Gretchen, did on Christmas when she opened her quilt. I guess it’s a universal reaction! What a lovely quilt and what a wonderful sister! My sister is like yours too. I think because of her I finally plunged my feet to open up the shop and actively advertise my ware. Happy holidays to you and my sis. That look is what makes it all worthwhile. To share your love and creativity with someone that truly appreciates you is priceless. Beautiful quilt you lucky girl Whit. 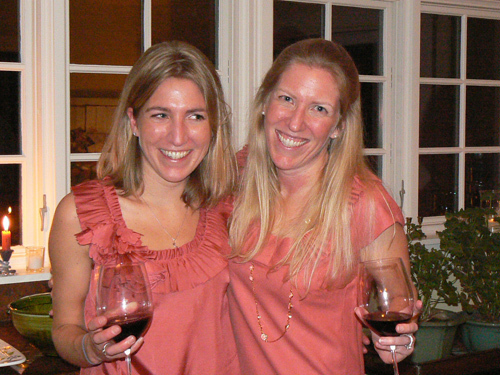 Your sister sounds just like mine, we often show up at events dressed the same unintentionally, she has much more opinions about fabrics, but doesn’t necessarily like to sew, and she is completely supportive of my endless talking about fabric and quilting. I love the quilt you made for her, it is just beautiful. I have had a stash of HR lightening bugs that I couldn’t decide what to do with, and now I think I know. This is a perfect way to really show the fabric. That is an amazing gift! I love the simplicity of this quilt. I am such a sucker for this line! One of my all-time favorites! 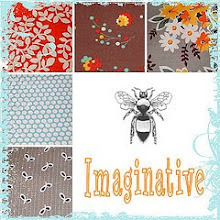 I just bought half-yards of the new Amy Butler line and was having trouble deciding what to do with them – they don’t seem well-suited to being cut up very small – and you’ve just made up my mind for me. I’m going to copy you exactly – if you don’t mind. 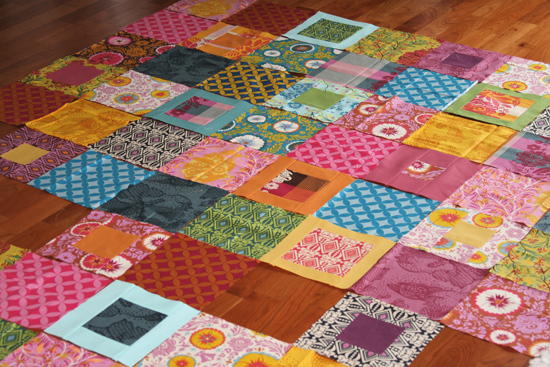 8″ squares with some scattered square-in-square blocks and a few Kona’s. Thanks! This is great – makes all the work worthwhile to know that the quilt will be loved and appreciated forever (and also make Whit think of you every time she sees it! Lucky girl! Love the quilt. we need a group showing looks on peoples faces when they receive quilts. i got a kick out of the amy butler quilt hanging in the background. quilts, quilts everywhere. What a fabulous quilt and the reaction picture is perfect – that shows how she really feels and apparently, quite excited:) Yay for her new quilt! I think this is my favorite! I have a bunch of fabrics I recently bought, and designed an elaborate design for with 8 inch blocks… and after perusing through your site and being introduced to the more free-form way of making blocks, I think I’m going to scrap my elaborate design and use the same fabrics for something like this! Can’t WAIT! I love your sister’s reaction! Gorgeous quilt.